Sassi offers southern Italian fare at its best. The unique setting is reminiscent of a villa situated off the Tuscan coast of Italy. With multiple warmly decorated dining rooms, private rooms, and an ornate outdoor al fresco dining area, it offers a wonderful setting for a meal, party, wedding, or any gathering of up to 150 guests. The quality menu offerings, coupled with the extensive list of fine Italian wines, are sure to please even the most fickle Italian food connoisseur. We arrive at the parking entrance to Sassi and encounter a large cobblestone circular driveway. It leads to the valet station and is quite attractive and unexpected. The fact that we are impressed by the design of the parking lot says quite a bit about the place. 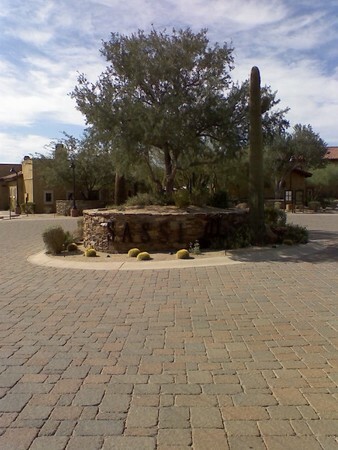 The driveway is in line with the restaurant’s ambience, which exudes a warm feeling. It is as though we have just arrived at a good friend’s home for dinner. There is a bit of a walk to get to the restaurant entrance, but it is enjoyable as we stroll down the cobblestone path past a large decorative water fountain. We both comment on how we expect to see the rolling hills of an Italian countryside. In reality, we are far from Italy. We are in Scottsdale, Arizona gazing up at the breathtakingly beautiful building made to look like an Italian villa. Once inside the double wooden doors, there is a long hallway. We give our name to the hostess and are led to one of the six dining rooms that make up this elegant restaurant. The hostess greets us warmly and seats us in the main dining room. She offers each of us a dinner menu. The menu is memorable; it is made of cork and quite handsome. Each of the tables has adequate spacing between them. This allows us to freely engage in conversation without having to tune out overlapping chatter from other tables. The tables are topped with candles, place settings, and fine white linen. The interior walls made to look like stone, would feel cold if not for the subdued lighting, fireplace, and dark hardwood floors. I notice the dishes right away. White with colorful borders of green and gold, I enjoy the way they mix and match with stripes and patterns. The artwork in the dining room is of the Italian countryside, providing a warm and inviting feel. Our waitress, Anne, arrives to greet us and take our drink order. My guest orders a glass of the 2003 Querceto Chianti Classico Reserva and I, a bottle of San Pellegrino sparkling mineral water. The Chianti is, not surprisingly, from the Tuscan valley of Italy. My guest, typically a Merlot fan, is happily surprised to find he enjoys the wine. It is dry, yet full bodied with a clean berry aftertaste. If ordering a bottle, it should be noted that Sassi offers an extraordinarily extensive list of fine Italian wines. While we peruse the menu, a basket of bread is placed at our table. It contains a combination of hard artisan Italian bread and lightly herbed focaccia. Our table has a large glass bottle of extra virgin olive oil that is rich and aromatic, allowing it to soak deeply into the crusty Italian bread. For an appetizer we decide on the pizza margarita. It arrives piping hot, with large slices of Buffalo mozzarella topped with thin slivers of fragrant basil and juicy ripe cherry tomatoes. The thin-crust pizza is sliced into four pieces making it a perfectly sized appetizer for two. Buffalo mozzarella, or “mozzarella di bufala” in Italian, is made from water buffalo’s milk rather than cow’s milk. This makes it a bit softer and smoother than mozzarella from cow’s milk. We agree to split a salad and chose the Insalate Campo di Fiore. The salad consists of fresh baby greens, garden vegetables, and fried chick peas tossed with a Champagne vinaigrette. The fried Chickpeas add a wonderful toasty, crunchy consistency to the salad and are a refreshing change from the croutons served at many restaurants. Sassi’s menu offers an array of interesting meat dishes; however, my guest and I choose pasta as our entrees. This is due in large part to the menu descriptions indicating many of them are handmade. My guest chooses the Orecchiette con Salciccia, a savory dish made with homemade orecchiette, sweet spicy sausage, rapini, and Pecorino Romano cheese. The ingredients rest in a light broth. I decide on the Pappardelle with wide spinach noodles, Abbruzzo style pork ragu, and Parmigiano cheese. 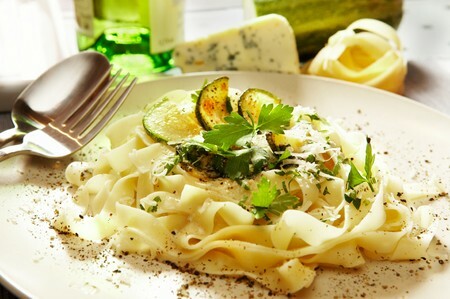 The homemade noodles in both dishes are excellent, arriving al dente and tasting freshly made. The aromatic pork ragu consists of shredded pork in a light tomato sauce. I taste hints of garlic, onion, and red wine in the sauce. Though we feel quite full after the appetizer, salad, and pasta courses we agree that we must order dessert. The dessert menu provides a refreshingly unique selection. After some contemplation, my guest and I finally settle on the Limoncello Cheesecake. It arrives artfully presented on a white platter. The Sicilian style cheesecake is a creamy mountain of Mascarpone, made with candied lemon peel that looks real. The Mascarpone makes the cheesecake much less dense than the New York style we are so used to here. It is more silky, creamy and smooth. The Limoncello liqueur adds just the right hint of lemon, without being overwhelming. We nearly finish the dessert we so enjoy it. After dinner, I visit the restroom. Inside, it is quite large containing several stalls. I look around and realize that each stall is actually a self containing bathroom, equipped with its own sink, mirror, toilet, and dresser, filled with bathroom necessities. Upon leaving, we decide to take a different route, and end up outside. 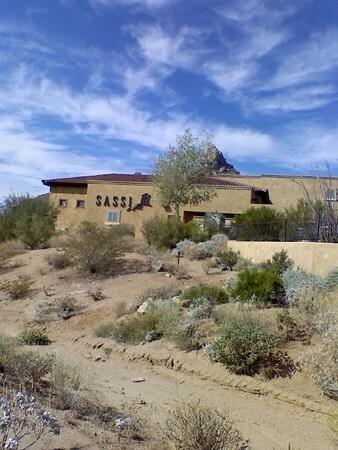 Situated at the base of Pinnacle Peak, the restaurant offers breathtaking views of the Arizona mountainside. The terrace opens up to an elevated outdoor dining area where one can take in the spectacular views of nightly sunsets. A wide stone path leads downstairs to the gardens. It is a carefully manicured, a perfect setting for a wedding or a romantic walk. Sassi offers southern Italian style fare at its best, in a setting that conjures the Tuscan coast of Italy. With separate dining rooms and an ornate, outdoor café-like setting, it is sure to please even the most fickle Italian food connoisseur. It is an inviting setting for a meal, party, or wedding for any gathering of up to 150 guests. Price is per person and does not include tax or gratuity. Italian Wine Pairings available for an additional $19/person. From the moment we got out of our car we were hooked by Sassi! The pathway and entrance was like we were in another world, so calming and beautiful. We were seated inside but we had the feel we were outside as well. Could see the mountains and sunset and feel the chilled breeze. It was so special!!!! The 5 star food made this experience great. It is now our restaurant of choice. We will share this experience with as many people as we can. The staff was so special too.Knew their menu. Thank you for a wonderful, special treat that we will never forget. We are in our 60's and my husband is a retired chef. We eat very well. We know what good food is. We can not wait to come back!! My biggest vice in life is eating a nice meal. I've been to many restaurants from real high dollar to low budget....And, when I say nice meal, I mean the total experience...from the atmosphere, staff, service, ambiance, food, drinks, etc. Sassi was by far one of the best dining experiences I've ever had....and THAT is saying a lot. I won't go into great detail, because you should experience it for yourself. But let me tell you that it was wonderful...try to get ther before sunset and asked to be seated in the Garden Terrace area close to the opening to the terrace...You won't be disappointed. Enjoy!!! My wife and I came for my birthday, and the location of the restaurant as well as the food was excellent. We heard some people had a hard time finding the place, but had no problem, as we used a GPS (since we are from out of town). Our waitress was excellent, as was the other service. We shared the grilled octopus, which I highly recommend, and I had the ravioli while my wife had the seafood squid ink pasta. Dessert was also amazing- the vanilla gelato I had was perfect, and my wife thoroughly enjoyed the Cherry chocolate truffle. I would highly recommend this restaurant.